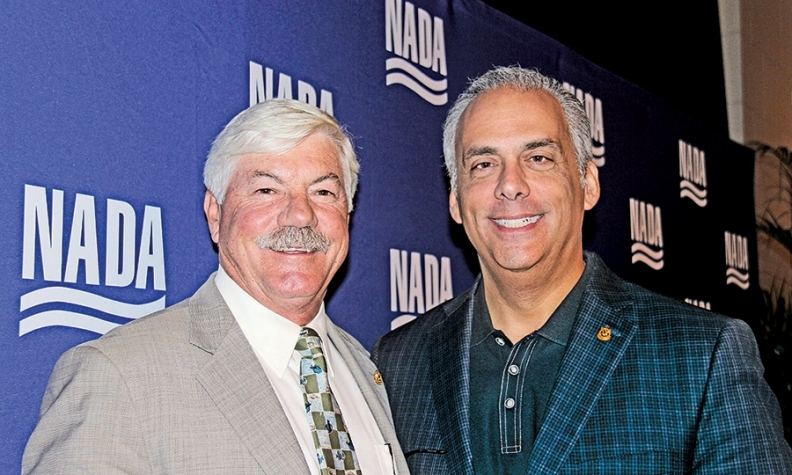 Jeff Carlson, left, vice chairman of the National Automobile Dealers Association, was elected chairman for 2016. Mark Scarpelli, right, was chosen as next year's vice chairman. The vice chairman typically succeeds the outgoing chairman, positioning Scarpelli to lead in 2017. The National Automobile Dealers Association chose Illinois dealer Mark Scarpelli to be its 2016 vice chairman, putting him in line to be chairman in 2017. Scarpelli, president of Raymond Chevrolet and Raymond Kia in Antioch, Ill., and co-owner of Ray Chevrolet in Fox Lake, Ill., was elected by the NADA board of directors last week at its meeting in Palm Beach, Fla. He represents metropolitan Chicago new-car dealers on the board, according to a statement. As expected, Jeff Carlson, the current vice chairman, was elected to succeed NADA Chairman Bill Fox. The vice chairman typically succeeds the outgoing chairman, meaning Scarpelli is now in position to replace Carlson as chairman in 2017. Carlson, the president of a Ford dealership and a Subaru dealership in Glenwood Springs, Colo., and co-owner of Summit Ford in Silverthorne, Colo., will take over as chairman in January. He represents Colorado dealers on the NADA board. "This is a great honor, and I'm eager to lead NADA as we continue the important job of protecting the interests of America's 16,500 franchised new-car dealerships, and the more than 1 million people they employ nationwide," Carlson said in the statement. Bill Willis of Willis Automotive Group in Delaware was elected secretary, while Neale Kuperman of Rockland Toyota in New York was chosen as treasurer.